The following article is excerpted from Healthy Aging® Magazine. To continue reading this article and to see recipes, subscribe to Healthy Aging® Magazine, the lifestyle magazine that is all about following your passion and what you can do rather than what you can’t. Over the years, the poor egg has been either celebrated or chastised for its nutritional value. Long considered a symbol of new life, the egg has rolled between super food hero and heart-attack trigger. Just when we finally felt we could eat eggs again without worrying about how it might be a silent killer, a new study was just released that might make some feel they should toss the egg while leaving others in disbelief. Maybe it’s because many of us have grown up hearing the virtues of eggs through the “Incredible Edible Egg” commercials that began in 1976. With Easter soon upon many of us and for those who look forward to their omelet brunch, we are left wondering if we can or cannot eat eggs. Is the Nutritional Value of Eggs What It is Cracked Up to Be? 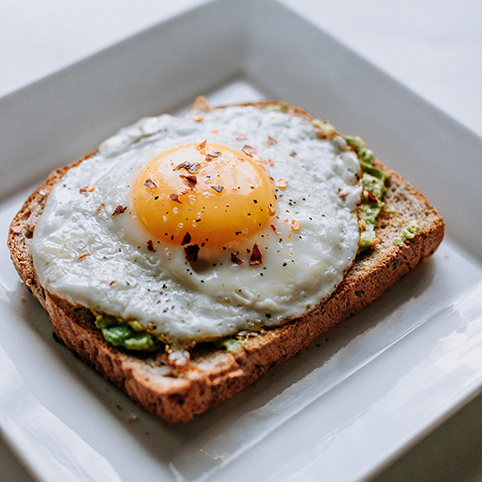 Eggs are a natural source of protein and 13 vitamins and minerals including vitamin D, riboflavin, selenium, choline and lutein while containing 70 calories. The high-quality protein contained in eggs is important to healthy bones and muscles. Along with exercise, protein can help slow the effects of sarcopenia, the loss of muscle as one ages. Choline is essential for liver function and the health of the brain while lutein is helpful in slowing the progression of eye diseases such as cataracts and macular degeneration. One egg contains 186 mg of cholesterol which is found in the yolk. Most healthy people can eat an egg a day without risking the development heart disease. Worried about too much cholesterol? Enjoy one egg with additional egg whites. In addition to an unhealthy diet, according to the American Heart Association, other factors affecting cholesterol include a lack of physical activity, smoking or exposure to tobacco smoke and excess weight. Over the years, the egg has been touted for these nutritional virtues and then demonized for its potential ill effects such as raising cholesterol levels. The image of eggs changed when a large study done in 2004 through 2008 suggested this nutritional powerhouse was not such a bad egg. The study of 500,000 in China of adults ages 30 to 79 showed daily egg consumption helped reduce the risk of cardiovascular disease while another in Australia showed those who ate up to 12 eggs a week showed no increase in cardiovascular risk factors for people with pre-diabetes or type-2 diabetes. Another small study 10 years ago suggested eating eggs was a bad as smoking. Other myths tout eggs as being a leading contributor to high blood cholesterol. Currently the US Dietary Guidelines recommend two to three servings of meat, poultry, fish, dry beans, eggs and nuts as a group. Yes, eggs. The new study just released in the Journal of the American Medical Association reports high consumption of dietary cholesterol such as in eggs is “significantly associated with higher risk of incident cardiovascular disease. According to The Egg Nutrition Center, the science and nutrition education division of the American Egg Board, “The inconsistency of this new study with that of other recent studies demonstrates the importance of additional research to further explore this area, including the need to understand the unique contribution of eggs as part of healthy eating patterns set forth in the Dietary Guidelines for Americans. To Egg or Not to Egg? As with any of the nutritional information released, the best decision is to choose moderation, base your decision on your own health requirements and when in doubt, check with your doctor. For now, what has been considered the symbol of new life seems to still be a good egg.